Downton Abbey meets Cassandra Clare in this lush, romantic fantasy from New York Times bestselling author Kiersten White. Kiersten White captured readers’ hearts with her New York Times bestselling Paranormalcy trilogy and its effortless mix of magic and real-world teenage humor. She returns to that winning combination of wit, charm, and enchantment in Illusions of Fate, a sparkling and romantic new novel perfect for fans of Cassandra Clare, The Madman’s Daughter, and Libba Bray. I began Illusions of Fate with no expectations except to expect to like it as I have enjoyed White's other books. I was not disappointed. It was a creatively written story with characters I connected with and felt for, romance I enjoyed, and enough action and magic to keep me intrigued in the story. I loved the beginning of the story and how it pulled me right in. I loved the sarcastic banter between Jassamin and Finn. It cracked me up. I liked that they admired each other from a distance in a way, but were thrown together eventually. I also liked the magic and how it worked. It just seemed interesting and I liked how spells were used. I also really liked how there were several twists and plenty of mystery surrounding the story. I wasn't sure who the crows worked for. Then I was surprised by the villain. I knew that a specific character was important but didn't know in what way until the end. I love it when a story can surprise me like that and still completely make sense. The romance could almost be considered insta-love, but it worked for me, especially as I liked the characters. There were some horrifying moments of violence that were a little too much for me, but definitely fit the characters and the story. This definitely had a very strong Gothic feel to it. 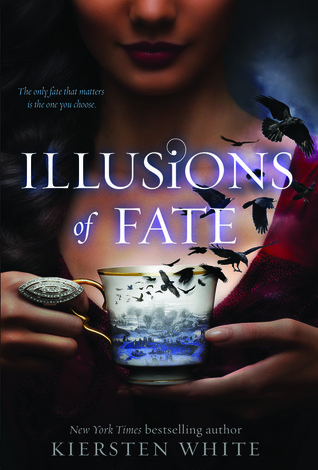 I literally could not put Illusions of Fate down and thoroughly enjoyed reading it! I definitely would love more stories like these from White. If you enjoy Gothic, romantic, and magical tales of fantasy, then I would definitely pick this one up. Source: From the publisher through Edelweiss, which did not affect my review in any way. Have you read this or plan too?